Count Gleichen ("Princes: No. 8") by F. Goedecker, a chromolithograph published in Vanity Fair 5 July 1884. © Natitonal Portrait Gallery (NPG D44181). Prince Victor Hohenlohe-Langenburg, better known as Count Gleichen (1833-1891), was the third and last son of Queen Victoria's half-sister, Princess Feodore, and her husband, Prince Ernst of Hohenlohe-Langenburg. The Queen always took an interest in him, and he proved himself entirely worthy of it: as a young naval officer, he took part took part in the second Chinese Opium War, and distinguished himself in service. Queen Victoria herself called him a "excellent and strict officer" and entrusted her son Prince Alfred to a ship under his command (Monday 24th March 1862). On retiring in 1866 due to ill health, the Count was awarded the KCB, and appointed governor and constable of Windsor Castle. He and his wife and children were very much part of Queen Victoria's wider family and social circle, and visits are often mentioned in her journals. At this point, Count Gleichen began to pursue his interest in modelling in a serious way. He studied under William Theed for three years, and set up a studio at his apartments at St James's Palace, where the Queen visited him: "Victor took me to his studio, in the garden, where there are many pretty things. The recumbent statue of old Sir G. Seymour is remarkably good..." (Journal, 28 February 1873). From 1868, he exhibited around two or three works a year at the Royal Academy's Summer Exhibition, twenty-five times in all (see "H.S.H. Count H.R.I. Gleichen"). Among his successful works were busts of Disraeli, Salisbury, and Sir Harry Keppel. He was especially noted for his colossal statue of Alfred the Great in Wantage. Eventually he was able to build his own house near Ascot. In 1885, when the Queen formally permitted his wife to share his princely status, he reverted to his original title. In 1887 he was promoted to GCB and admiral on the retired list. He died at St James's Palace, London, on 31 December 1891. He was survived by his son, Albert Edward Wilfred Gleichen (1863–1937) who became a Major-General (the Queen called him Eddy), and three daughters, the eldest of whom was Lady Féodora Gleichen (1861–1922), of whom the Queen was particularly fond, and who also became a talented sculptor. — Jacqueline Banerjee]. Monument to Sir Hamilton Seymour, St. Nicholas, Alcester, Warwickshire. Cust, L. H., revised by Andrew Lambert. 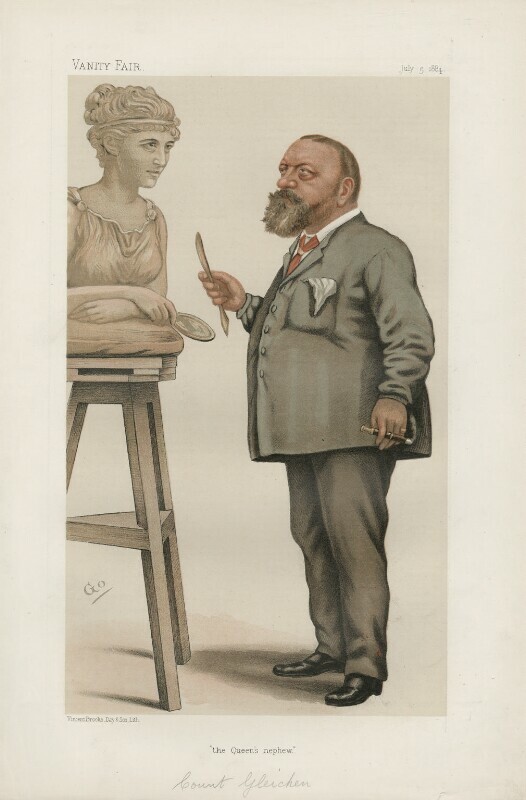 "Victor, prince of Hohenlohe-Langenburg [known as Count Gleichen] (1833–1891), naval officer and sculptor." Oxford Dictionary of National Biography. Online ed. Web. 30 March 2019. "H.S.H. Count H.R.I. Gleichen." Mapping the Practice and Profession of Sculpture in Britain and Ireland 1851-1951. University of Glasgow History of Art and HATII, online database 2011. Web. 30 March 2019. Queen Victoria's Journals. Web. 30 March 2019.